Thar she blows, right above the hospital. Yesterday I was down at the cancer center for a fluids infusion (pure saline; I can’t convince them to add anything more interesting) and was interrupted by a tornado warning. When the hospital declares a tornado emergency, all personnel and patients have to move into the hallways. So I trundled my IV stand into the hall, continuing my drip, and we all sat there for about 45 minutes. 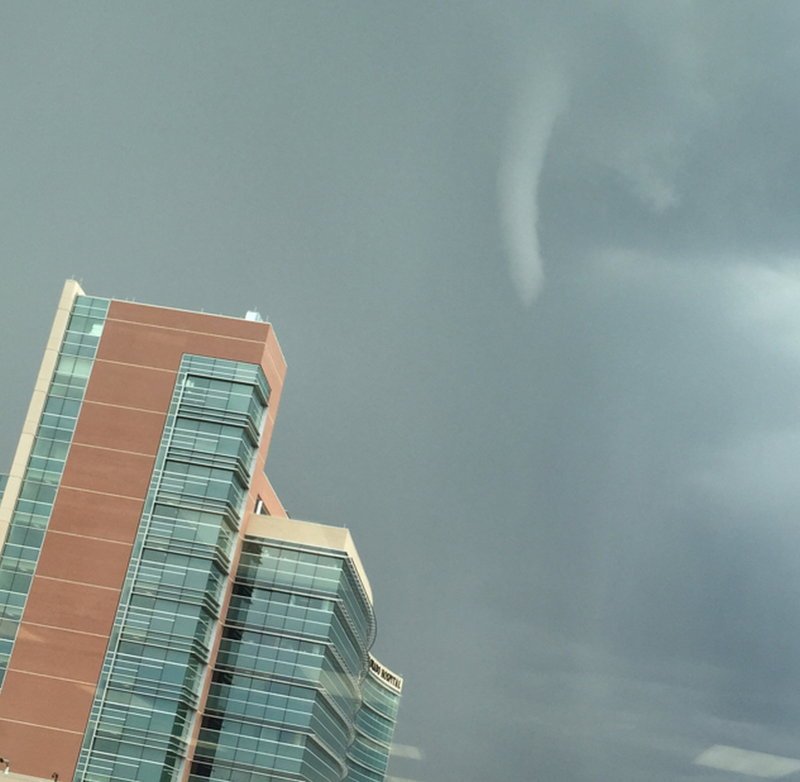 Turns out the funnel above the hospital was one of several spotted in the area, but none of them touched down. Wussy Colorado tornadoes. They could learn a thing or two from Oklahoma. A gal in the hall from Kansas said the same thing. I’d been watching the storms develop on the Wunderground map on my phone, and just about the time I told my daughter-in-law there was a nasty-looking cell just east of the hospital, they sounded the alarm. This is the second time there’s been a tornado while I’ve been down there. (Maybe they’ll invite me not to come anymore.) Something about the lay of the land (I’m guessing) causes Aurora (where medical center is located) to get smacked with whatever severe weather is in the area. It seems to be Ground Zero for the worst hail, thunderstorms, blizzards, and tornadoes. In any case, two tornadoes in as many months have me scrutinizing the sky every time I go down there. I was surprised when we had a tornado in Estes Park…you’d think the mts would limit the tornado dances in Denver area. There were plenty of chairs for everyone, pulled out of offices and nooks along the hallway. It was kind of funny, really, with nurses moving up and down the hall like flight attendants, checking everyone’s comfort, offering snacks, etc. We seem to get a fair number of funnels up and down the Front Range, but they are mostly tornado wannabes, rarely touching down and rarely doing much damage. The way people here react, though, you’d think they were full-blown hurricanes. If they move farther east though, out onto the plains, they can get nasty. Flight attendants – I can just see that. I’ve seen some really beautiful henna work on bald cancer heads. Some even making me envious. But I opted for a buzz cut (which has now grown out to a 1/2 – 3/4 inch fuzz cut) rather than a smooth shave, so they wouldn’t have worked on me. Nor did it seem they last long enough to be worth the effort and expense. I can’t imagine sitting still that long.